“Even during armed conflict, it is important to respect International Humanitarian Law (IHL) because this is how a country and region can build its future peace, and democracy,” stated Ms. Elisabeth Decrey Warner, President and Co-founder of Geneva Call, as she opened the discussion at MERI on Sunday, February 29, 2016. The occasion was a seminar on the compliance of armed forces with international humanitarian law. 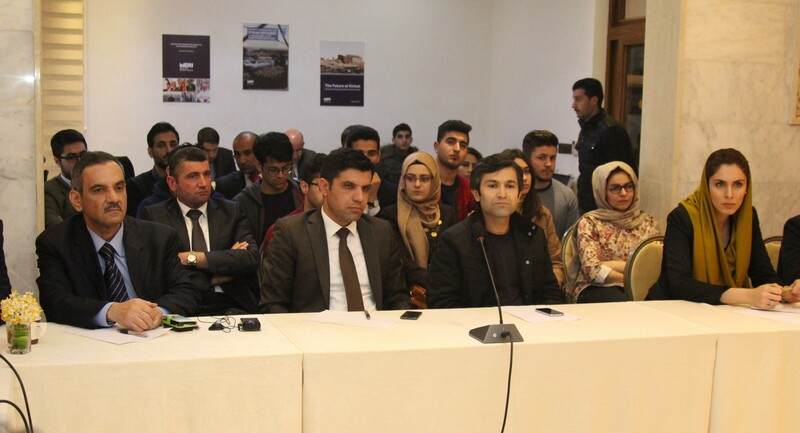 Before the seminar, a workshop was held to launch a program of future collaboration between MERI, Geneva Call and the Ministry of Peshmerga, with active participation of the representatives of the European Union Humanitarian Aid and Civil Protection department. Geneva Call is an international non-governmental organisation dedicated to promoting respect for international humanitarian norms in armed conflict, and other situations of violence, by armed state or non-state actors. In particular they focus on the protection of civilians by working with civil society organisations, armed forces and governments, religious leaders, and civilians to guarantee universal understanding of IHL and human rights. According to Ms. Warner, Geneva Call – unlike other organisations – prefers to engage non-state actors in the interest of protecting civilians. She joked that Geneva Call was labeled the ‘strange UFO’ of the humanitarian world because they were founded with the seemingly impossible goal of encouraging non-state forces to comply with IHL. “It is important to provide [non-state actors] with the opportunity to sign some type of international agreement, as they do not sign international conventions.” Geneva Call began working within the Kurdistan Region of Iraq (KRI) in 2001 when it successfully urged the armed forces of the PUK and KDP to sign an agreement banning the use of anti-personnel land mines. Mrs Ann-Kristin Sjöberg, Program Director for the Kurdistan Region of Geneva Call, reiterated their organisation’s dedication to progressing compliance with international humanitarian norms in the region, despite the increasing level of atrocities and violence. Jabar Yawar, Spokesman and General-Secretary of the Ministry of Peshmerga, reasserted that the KRG and the Ministry of Peshmerga are commitment to working collaboratively with Geneva Call and MERI on raising awareness of IHL and improving training of the armed forces. He noted that the workshop with Geneva Call and representatives from the Ministry of Peshmerga was not a reaction to recent reports published by international organisations on the Peshmerga in its current conflict with the Islamic State, but that the relationship has been continuous over the last 15 years. 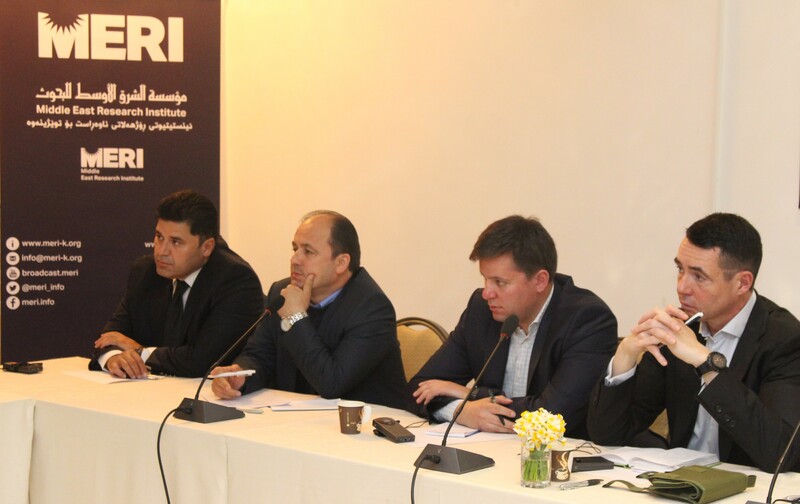 Rather, participants of the morning workshop focused on identifying institutional shortcomings in the Peshmerga’s ability to implement systems of accountability, although the recent controversial reports were indeed debated. Mr. Yawar insisted that the way to prevent individuals from violating KRG policy and IHL is to inform all – from the top commanders down to each soldier – what the policies are, and how to respect human rights in wartime situations. Mr. Yawar recounted the mechanisms that the Ministry of Peshmerga would like to put in place in order to build on its commitment to IHL. These included relying on collaboration with policy-research institutes such as MERI and expert organisations such as Geneva Call to research and identify gaps in the Peshmerga’s adherence and accountability to IHL. He invited both MERI and Geneva Call to take the initiative to engage in a formal collaborative agreement with both the KRGs Asayish (internal security) and Peshmerga. He referred to the need to identify gaps in legislation for, implementations of and compliance with IHL. Draft legislations can and should be submitted to the Kurdistan Parliament; and Geneva Call and other humanitarian organisations should be invited to develop training courses for soldiers, and to disseminate the principles of human rights through publications and manuals, outlining the rights and responsibilities of all armed forces. Indeed, Geneva Call is in the process of launching an independent media campaign entitled “Fighter not Killer,” to be broadcast in English, Kurish and Arabic throughout Iraq and the KRI raising awareness of international humanitarian norms and civilian protection. Similarly, MERI, in partnership with the Carnegie Middle East Centre and the Ministry of Peshmerga, are working to promote the institutionalization of Peshmerga and military – civilian relations in Kurdistan.